This is the first post of the blog that I hope to keep more up to date than my own personal blog. This blog will be a place where we post information about our family, probably more specifically about the kids' development. I can't promise wit or humour, but it will hopefully provide updates to what we are up to and what we plan on doing. 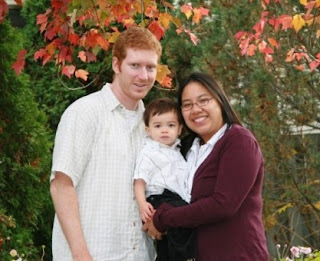 Here is a picture of our family from Thanksgiving 2008 - in front of the Kwok's house.